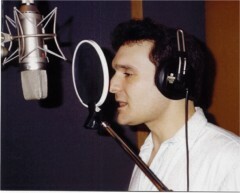 Aldo’s self-titled second album received both national and international airplay; that netted six singles on the #1 spots of various Indie charts including: Indie Tracker, Nashville Tracker, Indie World, Indie Central and Inside Country. In 1999, 2000 and 2001 this album also garnered several nominations from the Golden Music Awards (GMA) and Online Country Awards (OCA). Among the nominations were: New Country Male Vocalist, Male Rising Star, Album of the Year, Male Artist of the Year, Male Vocalist of the Year and Single of the Year. In 2000, Aldo won the GMA and OCA award for Country/Rockabilly Artist of the Year. Commitment to his craft and personal philosophy of “Whatever it takes” are evidenced not only in his music and industry achievements, but also in his explosive live shows described by his fans as “high-energy”, “inspiring”, “incredible” and “just plain fun”. Garth Cornell of WKKY Radio In Geneva, Ohio put it best when he said, "That guy doesn’t care if there are two people or two thousand—he will entertain them just the same. What a great entertainer". Aldo’s third studio album, Open Road, recorded with forward-thinking producer Ron Cornelius, is both a worthy addition to his already superb body of work, as well as a projection of the best qualities of work still to come. Forging new ground both musically and personally. The album's title track was released to radio markets throughout the U.S., South America, Europe, Australia and New Zealand. After sixteen weeks it became his seventh #1 hit on the Indie World chart, then the following week on the Inside Country chart where it remained for two consecutive weeks.